Marks: (S over D monogram), (D butterfly S), ISRAEL, A/P. 10-½” h x 9-¾” w x 3-½” d (26.7 x 24.8 x 8.9 cm) (galleon) 14-¼” h x 12-½” w x 6-½” d inches (36.2 x 31.8 x 16.5 cm) (case). 133.8 troy ounces (galleon) The A/P mark indicates the present lot was created as the artist’s proof. 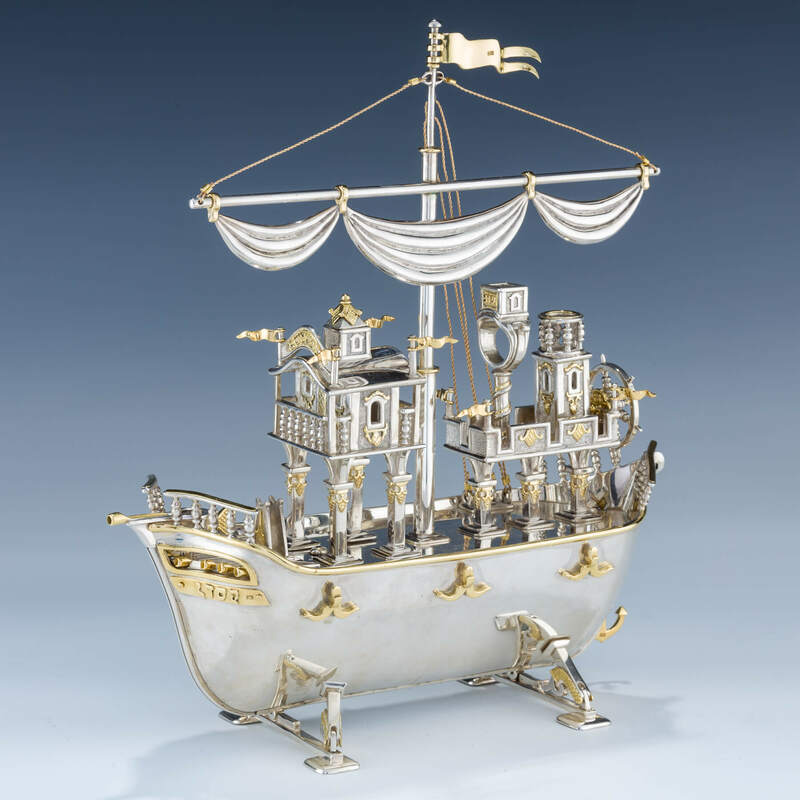 This is a Havdalah Set disguised as an elegant galleon. The ship’s hull opens to reveal its secrets. The galleon is marked A/P – Artist’s Proof. The ship rests on a mirrored base with a glass cover. The Havdalah implements included are:Six plates, two candle holders and a goblet hidden inside the ship’s hull. Spice box disguised as the deckhouse, oil lamp disguised as the prow, Havdalah lamps disguised as the focsle, dreidel disguised as the helmsman’s wheel, candle holder disguised as the crow’s nest, ring disguised as the binnacle.